“Look at my cousin Ronnie’s pigeons”? Is that what you crazy kids are calling it these days? 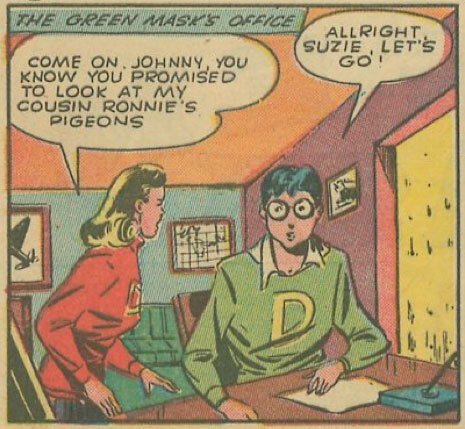 I’m late in catching this, but…Johnny (…whom I believe is the Green Mask’s alter ego) looks a lot like Harry Potter. The Green Mask must be the wizarding worlds answer to the Green Hornet, or Captain Marvel (Shazam). I think sombody wants Johnny to fly up into her hairy “pidgeon coop”! Jeff, was looking at todays in comparison to this one. Did they change her body a lot or something? This one her head looks to be in porportion to today’s and that she simply has a big chest. On today’s it looks like either she’s got such a massive chest that it makes her head look small or or head was slightly smaller making her chest look enormous. She looks like she oughta have something like an E or a F cup chest in today’s while in this one she looks a bit more natural. The art on this book is pretty bad, knight1192a. I don’t know anything for sure, but the sense I get is of a company floundering, trying to revive sales any way they can while keeping costs low. So they hit on this “Captain Marvel Knockoff” revamp, but probably couldn’t afford to hire anyone decent to draw it. Ok, thanks for the explination. Explains a lot on the difference in her appeance form the two panels.